The HS50 Stereo is Corsair’s new mainstream 3.5mm headset, which will sit alongside the Void Pro flagship range. We assume that more advanced SKUs of the HS50 will launch, but nothing has been confirmed. For this model, using an analogue connection means that Corsair cannot offer any lighting or fancy audio effects like virtual surround sound, but this could be a blessing in disguise if comfort and sound quality remain strong. At this price, the HS50 Stereo faces stiff competition from the ever-present HyperX Cloud, but Corsair actually undercuts that slightly, and the designs looks strikingly similar, so let’s see if it can compete elsewhere. We were a little alarmed at how lightweight the HS50 initially felt, but thankfully this belies its build quality, which is actually great. The HS50 feels durable thanks to its metal headband and aluminium yokes that attach the earcups; the latter are plastic but still rigid. There is no exposed wiring, keeping the look clean, and being lightweight is a benefit for comfort too. The non-detachable, rubberised, 1.8m cable terminates in a mobile-style (four-pole) 3.5mm jack, making it compatible with consoles (Xbox One needs an adaptor, sold separately), and mobile devices, but a splitter cable is included for those with dual three-pole jacks such as those found on PC front panels. The all-black carbon SKU is the least expensive of the range, as Corsair also has Xbox One and PS4-oriented gamers for £60, the former coming with green stitching on the headband and green highlights on the earcup, and the latter replacing the green with blue. Note that the Xbox One one still does not include the necessary adaptor. The left earcup has onboard controls: a wheel for volume control and a button for microphone muting. The microphone itself is detachable and plugs into a standard jack covered by a removable rubber tab. This makes a bit more fussy than integrated solutions, but it’s also cleaner and looks better if you’re on the go – I certainly wouldn’t feel silly wearing these out and about, which is more than can be said for many headphones. The HS50 is a rather large headset. I usually have to increase the extension on the headbands to get a comfortable fit, but here I found that none was necessary, even though they can extend a fair amount. Rotation on the earcups is a bit limited, but they still fit well. 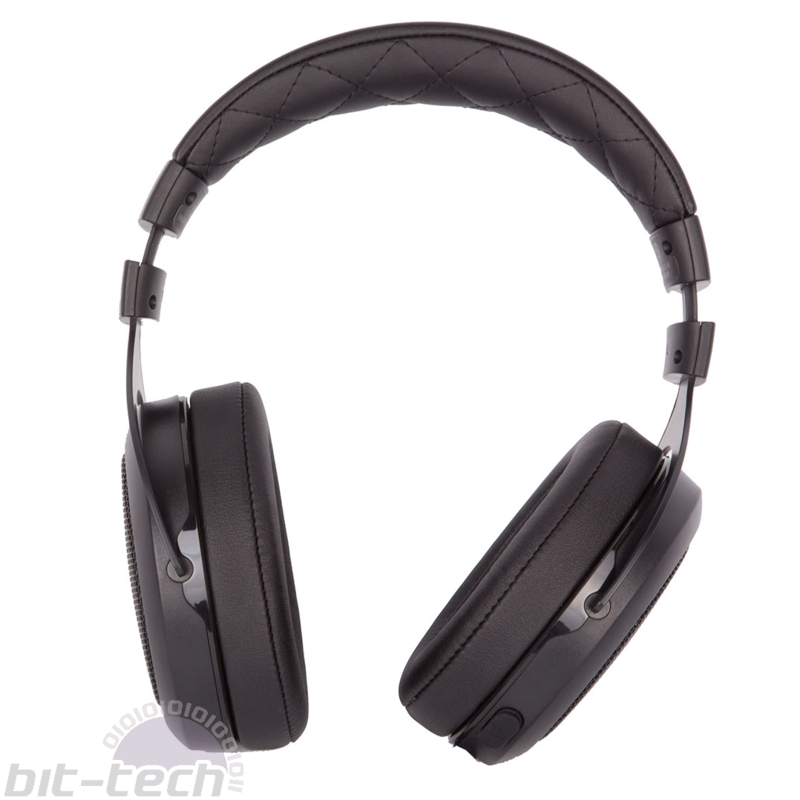 There is a generous application of padding on the headband and the oval-shaped earcups (memory foam). I found the HS50 was a bit firmer against my skull than the HyperX Cloud and that the clamping force was a tad more noticeable under my ears than I’d prefer. Nevertheless, the Cloud has always excelled in comfort, and Corsair comes very close here; I’d happily wear these for hours at a time without fuss. Corsair is using 50mm neodymium drivers here, and initial impressions from my usual test tracks were very positive. 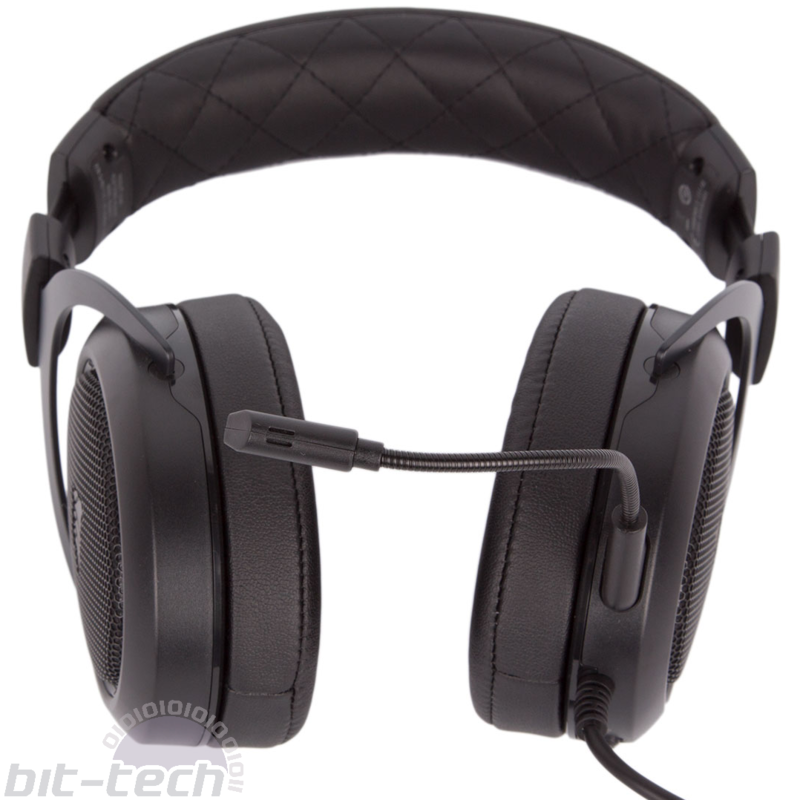 The bass has suitable punch for a gaming headset without getting flabby at the lowest frequencies and without detracting from songs. Vocals sound natural, the mid-range is rarely too crowded, and highs are crisp and sharp – though still not quite to the degree that they are on the Cloud. High-octane games like shooters and racers sound great as well. In short, it’s a very good audio solution for the price. The flexible unidirectional microphone is easily positioned to wherever suits you, and Corsair claims that it has noise-cancelling properties. We found this to be accurate if the sound was coming from behind the mic, such as from your keyboard or speakers, with our voice even when whispered being clearer than those loud sounds when deliberately made loud. However, noise from the headset itself can carry quite easily into the mic, so if you play at loud volume you risk annoying teammates. Actual voice clarity is fairly good; there seems to be a focus on recording higher frequencies, so you shouldn’t sound too booming and will be easier to pick out in explosive battlefields. One final thing of note is that the headset is Discord-certified. The popular chat software offers this certification process for free to manufacturers, and you can find more information here as well as a list of headsets that passed certification. Corsair’s HS50 is by no means the only headset to feature this, but if you’re a big fan of Discord this may add weight to your buying decision. For £55, this is an impressive headset. There are certainly similarities to the HyperX Cloud, but given the success and popularity of said headset, you can hardly blame Corsair, and we’ve confirmed that it is actually the company’s own product rather than the HyperX one, which is licensed from Qpad. It doesn’t quite dethrone the Cloud in sound quality or comfort, but it gives it a very good run for its money and is a decent and actually a slightly cheaper alternative. Well played, Corsair.